I was never big my whole life, just 'skinny-fat' I guess. Not healthy, but thin-ish. I just had my first child in September. He was 10lb2oz when he was born!!! I was only 95lbs when I got pregnant, but 149 when I had my c-section. But despite the fact that I gained more than 50lbs, it was almost all water weight and in my stomach. Not because I stayed fit or ate healthy (though I really should have) but just because of my mutant metabolism. So, I lost a lot of weight really quickly in the beginning. But was also breastfeeding for the first three months. So, my question is and ultimately what led me here is what do I do now? My stomach looks like a leather handbag and my breasts are no longer a fun place to be. My partner doesn't seem to care one way or the other, but I care and as I'm sure you all know low self esteem is beyond terrible. Is there anything I can do? I feel like there's no coming back from this due to the extreme stretching of the skin and then boomerang back. Or maybe if I was able to breast feed longer. 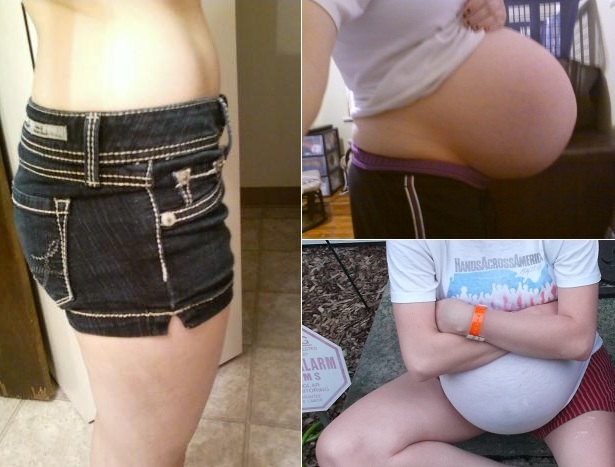 I understand that pregnancy changes your body but is this really it forever? Anyway, PLEASE HELP! I will taking any insight into this topic matter you have to offer. I will post a before and after picture so you can see the ridiculousness of my pregnant body. (PICTURE)About a year before I got pregnant and about a week before I had my son. You have youth on your side, so your skin might tighten back up some on it's own over time, and strength training combined with healthy diet would probably help the appearance of the loose skin by firming up the tissue underneath. Unfortunately, some of the havoc wreaked on the body from pregnancy can't be undone, short of plastic surgery. I have the same issue to some extent, and it's been 13 years since I was pregnant. It definitely improved with some time (I was 21 when I had my daughter), but when I feel any insecurity creeping in, I just remember that those imperfections are like badges of honor... I earned them and they were well worth it! I am not going to lie - your skin will never go back to normal without surgery. Time, vitamin E supplements and perhaps a less self critical eye will go a long way, but to go back to before you will need surgery. But you did something amazing, you made a person. Who is to say that your new body is inferior? I would check out this website, you may find it soothing.